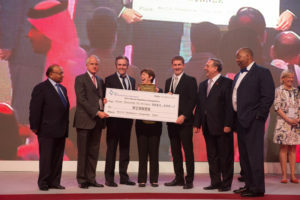 The International Chamber of Commerce (ICC) World Chambers Federation (WCF) has received a record number of innovation and best practice projects for the World Chambers Competition, a prominent feature of the ICC WCF 9th World Chambers Congress to be held in Torino, Italy in June. Open to more than 12,000 chambers across all five continents, the Competition has received 79 applications from 40 countries for the 2015 edition, making this year’s event the biggest since its launch in 2003 in Quebec City. “The World Chambers Competition is more than just an awards programme. It is a unique forum to showcase the ingenuity behind cutting-edge business projects undertaken by small- and medium-sized enterprises that are part of chambers of commerce worldwide,” said Rona Yircali, Honorary Chair of the ICC World Chambers Federation and Chair of the Competition jury. The Competition is an unparalleled opportunity to raise the profile of these ground-breaking projects and give them significant and much deserved visibility in the world business community. “The Competition is an unparalleled opportunity to raise the profile of these ground-breaking projects and give them significant and much deserved visibility in the world business community,” Mr Yircali said. Successful chambers will be invited to present their projects to an audience of chamber delegates and business professionals during Competition finals at the 9th World Chambers Congress which will take place on 10-12 June. Winners of each category will be announced at the Congress’ gala dinner on 12 June. The 9th World Chambers Congress, taking place from 10-12 June in Torino, Italy is the largest global gathering for chambers of commerce. Held every two years in a different region of the world, the Congress is the only international forum for chamber leaders to share best-practice experiences, exchange insights, develop networks, address the latest business issues affecting their communities and learn about new areas of innovation from other chambers around the world. Applications for the 2015 World Chambers Competition are now closed.